In last week’s post, we discussed the advent of TV Attribution and the new opportunity marketers have to drive more ROI in a multi-screen world. This week, we’ll discuss 5 key ways that TV Attribution can help you get more from mass media investments with digital insights. If you want more details on any of our top tips, take a look at our recent white paper or register for our upcoming webinar. 1. Align creative across channels. If a friend was always chummy on the phone, but cold in person, wouldn’t you be confused? Don’t let a choppy brand presentation put off interested consumers who experience TV ads, search online, and visit your sites and apps. Use consistency between your online and offline presence for a clear message. 2. Empower mobile search. Knowing that TV ads inspire mobile searches, make sure digital copy aligns with verbal and on-screen messages in TV ads to ensure consumers find you online. Use mobile context — include click-to-call, highlight nearby stores, show relevant hours — to move consumers from search to purchase. 3. Connect the data. Connecting TV airings data with digital signals like search query and site traffic offers a new level of granularity and immediacy of reporting. With better insights, you can fine-tune your next TV campaign and align digital strategies to capture incremental opportunity. 4. Find your best audiences. Take the guesswork out of demographic targeting with digital insights. 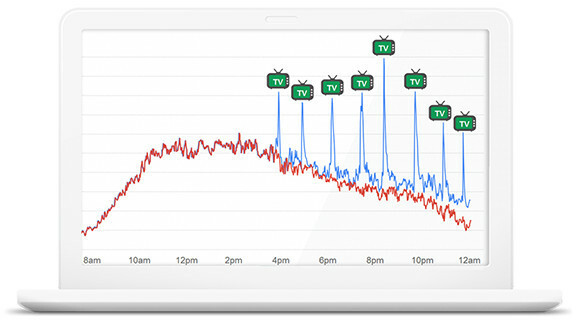 Search and site data reveal who is really responding to TV messages by taking online actions — so you can confirm your best audiences by behavior. 5. Understand your consumer. Analyze digital signals to understand what parts of your message consumers are retaining — or not retaining. The keywords consumers search after being exposed to your TV ad offer insights that can drive faster campaign optimization, saving time and money over traditional surveys or studies. TV Attribution not only offers a new, immediate, and granular view of mass media impact — it allows you to create more cross-channel synergy. Today’s consumers want immediate gratification and have high expectations for the brands they pursue. Join us for a webinar October 28th to discuss more tips and tricks for meeting new consumer expectations, and hear how top brands are leveraging minute-by-minute TV Attribution analysis to improve cross-channel marketing. If you’re ready to dive in, register here. Today’s consumers hop from screen to screen according to their needs-of-the-moment. They don’t give a thought to what “channel” they are using to interact with your brand — they simply expect brands to keep up.